Good morning, Friends! As anyone who knows me knows, I’m maybe the most patriotic person you’ll ever meet. My father retired from the U.S. Army after serving two tours each of Korea and Vietnam, my husband’s grandfather was a WWII POW, and my own brother served 20 years in the U.S. Army. Even my mother (88) is a Woman Veteran from an era when not so many women were enlisted in the armed forces. So I believe in this country, the freedoms we’ve been granted, and I have the deepest love and respect for those who’ve sacrificed their lives for those freedoms and our right to vote as Americans. So with that in mind, I believe strongly in the need for every American to vote, REGARDLESS of their political views. Because today is ELECTION DAY, I’ve decided to give away one advance reader’s copy of ROAM to one lucky entrant. NOTE: (10:02AM, Central Time) I am REVISING the rules for this giveaway. I originally offered the giveaway for anyone who voted and took a selfie with an “I Voted” Sticker. I’ve been advised that this is not legal…it is against federal law to giveaway anything in exchange for voting even if you’re not promoting a particular candidate, and I guess I can see why. So…to rectify that, this giveaway is open to ANYONE WHO REPLIES with a comment encouraging others to vote. HERE ARE THE AMENDED WAYS TO ENTER:! Go to my Twitter or Facebook Page and find the post pinned to the top of the page with the image below. Reply with one reason you think voting is important. Bonus entries for (1) following me on Facebook or Twitter, and (2) Sharing the post with your friends. That’s it! You’re entered! I’ll combine the entries from Facebook and Twitter and choose a winner tomorrow morning. I’ll even make it easier for you: click on one of the following links to go straight to the post you need to use. PLUS, I’ll give you a BONUS entry if you SHARE that tweet or Facebook post with your friends and followers. Just make sure you tag me so I see it. If you have problems tagging me, then send me a message so I can make sure to count your 2nd vote. So get out today and vote! NOTE: Because I can no longer honor entries for “voting,” I am no longer able to offer a bonus entry for first-time voters. My deepest apologies for the confusion. Seventeen year-old Abby Lunde and her family are living on the streets. They had a normal life back in Omaha, but thanks to her mother’s awful mistake, they had to leave what little they had behind for a new start in Rochester. Abby tries to be an average teenager—fitting into school, buoyed by dreams of a boyfriend, college, and a career in music. But Minnesota winters are unforgiving, and so are many teenagers. 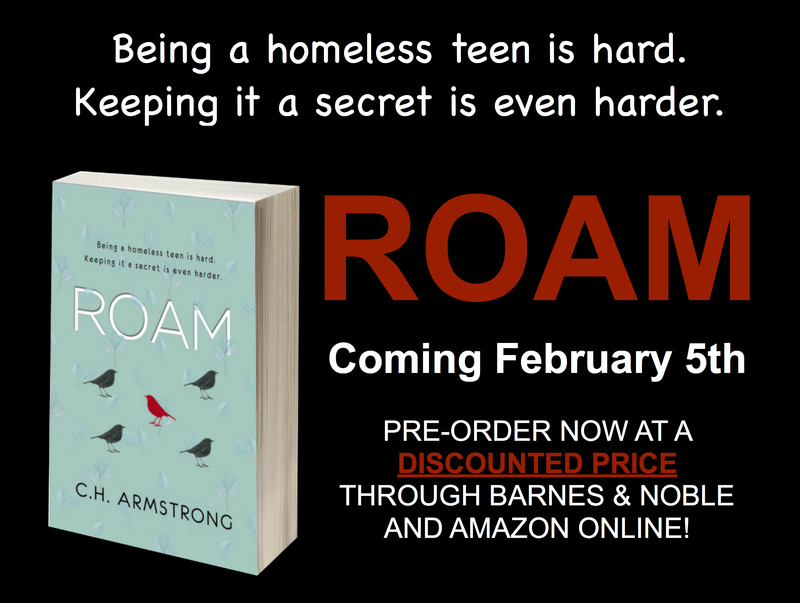 Her stepdad promises to put a roof over their heads, but times are tough for everyone and Abby is doing everything she can to keep her shameful secret from her new friends. The divide between rich and poor in high school is painfully obvious, and the stress of never knowing where they’re sleeping or where they’ll find their next meal is taking its toll on the whole family. As secrets are exposed and the hope for a home fades, Abby knows she must trust those around her to help. But will her friends let her down the same way they did back home, or will they rise to the challenge to help them find a normal life?